this one bowl chocolate cake comes to you from The 5 Second Rule.com. it truly IS an easy cake to whip up. the first time i made it for this post i might have over baked it for about 3-5 minutes. i followed the recipe for 30-35 minutes. the second time i baked it for 25 minutes...much better...delicious and moist. so i suggest you be an "oven-watcher". make sure you do not over bake...this cake can not handle it. i have found through trial and error the correct ratio of chocolate to cream. i've checked so many different sites and blogs with so many different opinions, but i found that matching ML's to GRAMS works best. example...175 grams chocolate to 175 milliliters heavy cream. i like to use Guittard coverture dark chocolate discs with a couple tsp of corn syrup to create a nice smooth soft chocolate coating. make sure you pour glaze on cake over a clean cookie sheet or parchment to catch the run-off. scrape this up then put in a bowl in the fridge. 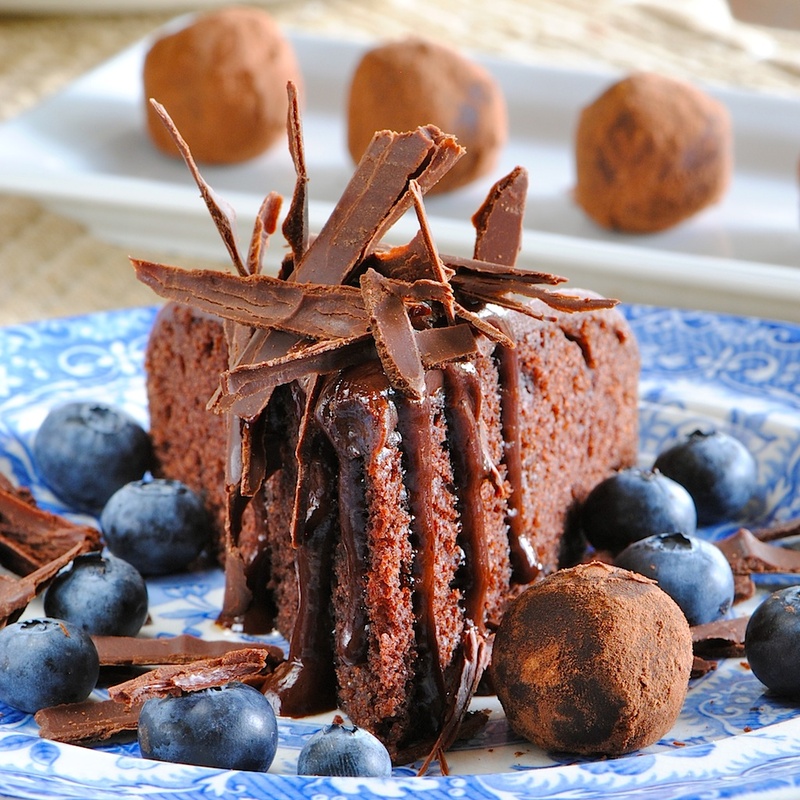 you can whip up some delicious truffles to add along as a bonus treat or enjoy them after the cake is long gone. they last in the fridge at least a week or maybe two. just wait until it is solid. using rubber gloves form the ganache into balls then roll in cocoa powder. these truffles will be VERY soft at room temperature so store them in the fridge. and any truffle is a good truffle. rewarm the ganache over double boiler before cake service and pour as sauce over individual servings. preheat the oven to 325F. grease a 9 inch round cake pan. line with parchment. sift flour, cocoa powder, sugar, baking soda and salt into a large bowl. add the butter, sour cream, milk, egg, vanilla and mini chips. mix well with a wooden spoon or rubber spatula. it's okay if the batter is a bit lumpy, but make sure there are no clumps of undissolved dry goods. scrap into prepared pan. cool on rack for a few minutes then unmold and cool completely. above photo you can see a little condensation from being in the fridge. this will disappear when bringing the cake to room temp to serve. #1...have your cake ready for the glazing. cake should be on a 9 inch cake board for easy lifting. place cake over wire rack and have something under that to catch the over-flow of ganache. heat cream, chipotle(if using) and syrup in a small sauce pan to just boiling. NOTE...if using chipotle you must strain the cream mixture before adding it into the chocolate pieces. pour hot cream over chocolate and let sit for a minute. start to gently stir from the middle. take your time. 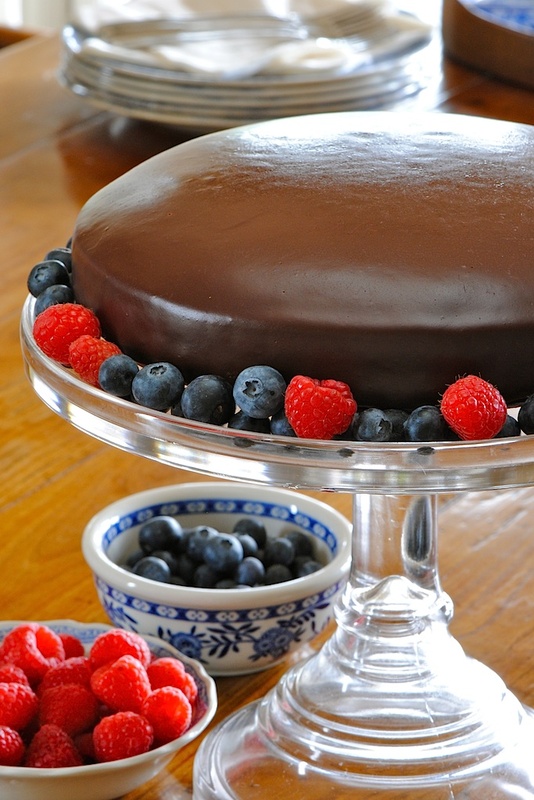 you will see the ganache come together. when it is fully incorporated, smooth and glossy, you are ready to pour. start pouring onto the middle. you might want to "over pour"...as in pour a lot on. 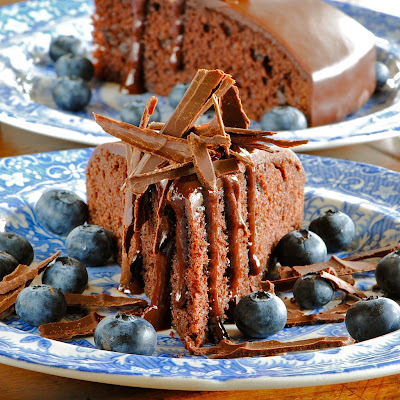 you might find it necessary to carefully pick up the cake and gently wiggle the ganache to get it to flow evenly over the cake. DO NOT go back with a knife or spreader to fix any imperfections. this might take a little practice, but it is quite easy and makes a stunning presentation. 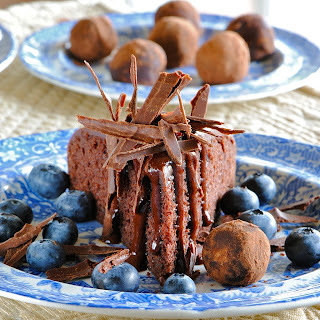 you can always cover any tiny flaws with some shaved chocolate...or chalk it up to the cake with "character". 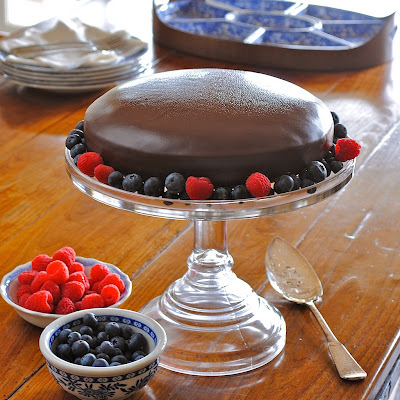 NOTE...you can refrigerate the finished cake to set the ganache, but must take out ahead of time so the glaze does not have condensation(as shown in photo). the second time i made the cake the day before and glazed the cake hours before serving. i put the cake in the fridge for about 20-25 minutes to just help set the ganache then left the cake out for service in a few hours. 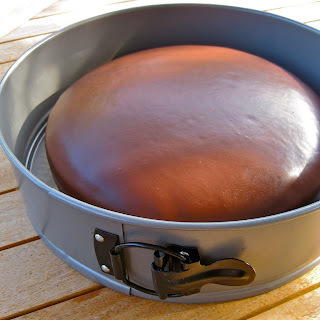 if you do not have a cake cover small enough for the fridge...i like to use an over-sized spring form pan to protect the cake from prying hands and fingers while refrigerating or for traveling. make sure you secure the bottom if traveling so it won't slide. 0 Response to "One Bowl Chocolate Cake with Chipotle Chocolate Ganache"